There is something about living in a place with four seasons that offers both perpetual excitement and longing. As we leave winter, I find myself craving one last snowfall, while at the same time itching for a warm breeze filling the sails. It’s easy to dismiss the merits of mud season, but I find that the change of seasons always brings new life and a new way of enjoying this state we love. There is a certain calm, a tranquility that comes with the off season. There is a feeling that it is yours, and only yours, to enjoy. Inspired by the birds chirping and warmer temperatures, we decided to take a trip up the coast. Enjoy! It is a beautiful March day — bright sun and 38º F. Having just lived through a Maine winter, we were thrilled about the “warmer” weather and continued up Route 1 with the windows rolled down, the moonroof open. We breezed through Wiscasset, without gobs of people waiting for Red’s Eats or any traffic on the bridge, and continued up the coast. This offseason adventure was off to a good start! Eventually, we turn right onto Route 131 in Thomaston, a lovely winding road down the St. George Peninsula. We stop at several vistas for photos of little coves along the shoreline, still packed with sea ice. At the bottom of the St. George peninsula is Port Clyde, a working lobster port often buzzing with vacationers ready to hop on the Monhegan Ferry or swing by Marshall Point Lighthouse. This time of year, we only encountered a few hardy lobstermen pulling traps. One spot that is certainly still open is the Port Clyde General Store, a perennial favorite of mine with the old-school general store feeling still intact. We refill our coffee mugs and start driving up the eastern side of the peninsula. Tenants Harbor is our next stop, parking down by the wharf that houses a Luke’s Lobster restaurant. The last time we were here was on A Week In Maine with Allagash Brewing. Today, traps take the place of picnic tables. 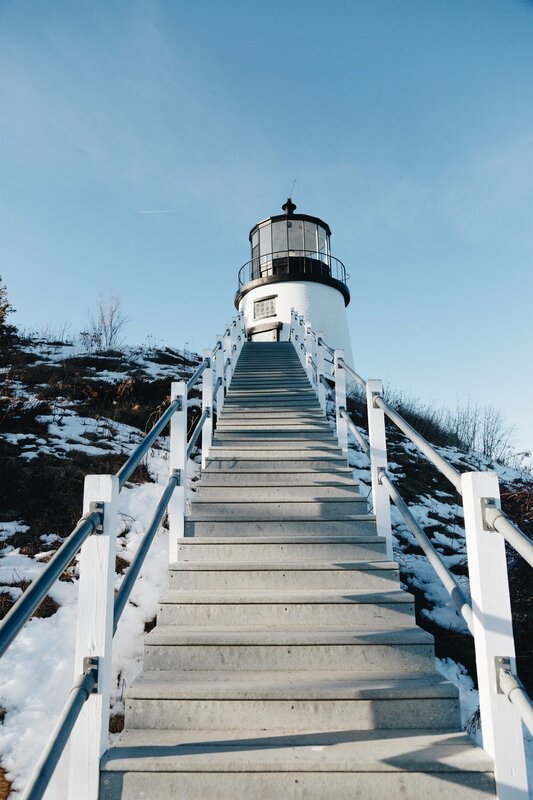 For those that haven’t been, Tenants Harbor is a quintessential Maine harbor, with boats moored throughout, islands on the horizon, and lighthouses around the corner. Sitting at the mouth of the harbor is Southern Island, which is owed by the Wyeth family of painters (lighthouse included). A quick jaunt up to Spruce Head Island gives us the picturesque McLoon’s Lobster Shack, glowing in the late winter sun, before making our way over to Owl’s Head Lighthouse. Today it is almost empty—just one other couple is out there. We hide from the wind on the lee side of the lighthouse, where we watch the Vinalhaven Ferry pass in front of the snowcapped Camden Hills. While the St. George peninsula may be a quiet escape at this time of year, Rockland is still a vibrant town with lots to do, even in the offseason. We wrapped up our drive with some dinner in Rockland before heading home. This may not be the most popular time of year to visit the midcoast, but for that very reason I recommend it! Maine is up for your interpretation — all year long.